Come join us in the TVA gym on Sunday, October 30 from 6-8:30pm for an evening of fun family entertainment! Buy some tickets (25 cents each), play some games and eat some food to help support TVA's classes! Pre-purchase your game and food tickets for a discount! Beginning Monday, October 24 you can purchase 100 tickets for $20 at TVA's front office. Week of Prayer is a special time every year when TVA comes together as a family to draw closer to God. TVA will be having its annual week of prayer starting on Monday, October 24th to Friday, October 28th. All are welcome to join us at 9:00AM in the school gym. If your child didn’t get a chance to take their picture or if you didn’t like the way they came out, you will have the chance to retake them on Wednesday, October 26th. If your child is retaking their pictures, please make sure you bring the complete packet to return to the photographer on October 26th. Quick reminder - there is NO SCHOOL on Monday, October 31st due to teacher report card prep day. Come one, come all and join us for our 9th Annual Holiday Bazaar! We are looking for local vendors who would love to participate in our bazaar. It will be held on November 13, 2016 in the TVA gym from 10AM-3PM. We offer you the opportunity to showcase your products or business and attract new customers in the community, while supporting a worthy cause, our children. For more details contact tvaholidaybazaar@gmail.com or stop by the front office for an application. Stop by the front desk during recess or after school to pick up a scented pencil (or five!). 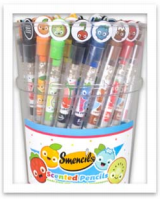 Smencils are $1 each or 5 for $4. Any student in any grade not picked up on time after school will be taken to the before and after school care (BASE). This includes middle school and high school students. Also, any child not picked up after their practice or game will be taken to BASE (between 4:30 PM and 6:00 PM). If your child's game does not start until an hour after school is out, then they will be taken to BASE until their game starts. TVA t-shirts and mugs are for sale now in the school office! Show your Eagles pride with one of our t-shirts, long sleeve shirts and/or coffee mugs. Cost is $6.00 each. We have youth small, medium, and large. We also, have adult small, medium, large and extra large.